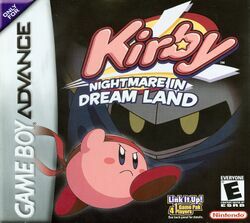 Kirby's Adventure was remade for the Game Boy Advance and released as Kirby: Nightmare in Dream Land, known in Japan as Hoshi no Kirby: Yume no Izumi Deluxe (星のカービィ 夢の泉デラックス, Hoshi no Kābī Yume no Izumi Derakkusu?, lit. "Kirby of the Stars: The Fountain of Dreams Deluxe). This remake was released in Japan on October 25, 2002, and in North America on December 2, 2002, and features updated graphics and sound, as well as some minor changes to the gameplay, new minigames, and a new sub-game in which Meta Knight makes his debut as a playable character. Kirby: Nightmare in Dream Land was re-released on the Wii U Virtual Console in 2014. After Kirby wakes up from his after-lunch nap without having any dreams, he goes to the Fountain of Dreams to investigate. In doing so, he discovers that King Dedede has stolen the Star Rod, the source of power to the Fountain of Dreams, and broken it into seven pieces, giving six fragments to his allies and keeping one himself. Without the Star Rod, all of the inhabitants of Dream Land are becoming restless and unable to dream. Kirby decides to track down the fragments of the Star Rod and bring them back to the Fountain of Dreams in order to restore everyones' dreams. This page was last edited on 13 July 2015, at 20:03.